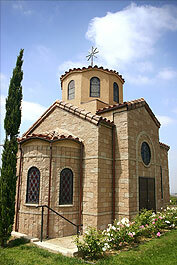 The Greek Orthodox Memorial & Cultural Foundation of Southern California was established in 1999 as an independent Non-Profit Religious Corporation supporting the Greek Orthodox Metropolis of San Francisco. The intent of its founders was to help uphold and perpetuate the Greek Orthodox religion, customs and traditions, ethnicity, culture, history of the language, music, Byzantine Art, and the performing arts. It began with a dream and a vision many years ago. A place where those who share the common orthodox faith and who's beliefs are the same have a common area to be buried whereby they will be remembered forever and never forgotten. 3) St. Nicholas Byzantine Iconography. 4) Religion, Customs, Traditions and Culture.